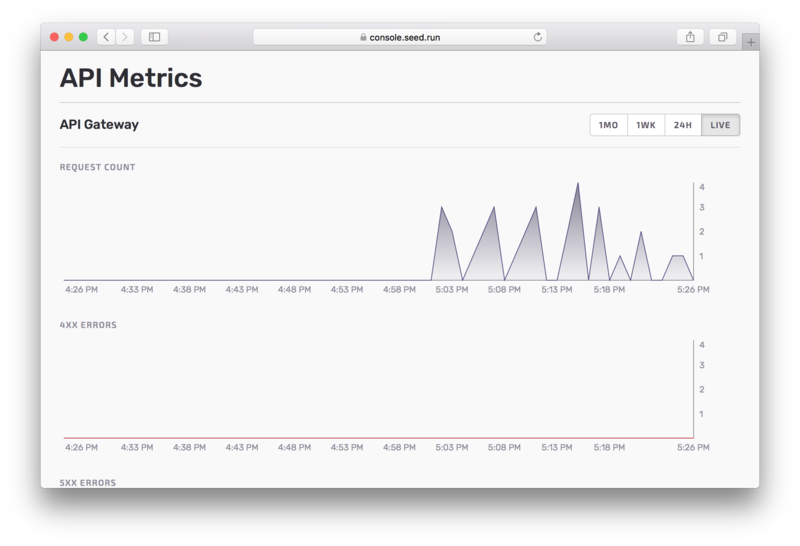 Seed pulls together CloudWatch metrics to give you an overview of your deployments. You can view the metrics for your Lambda and API Gateway endpoints. 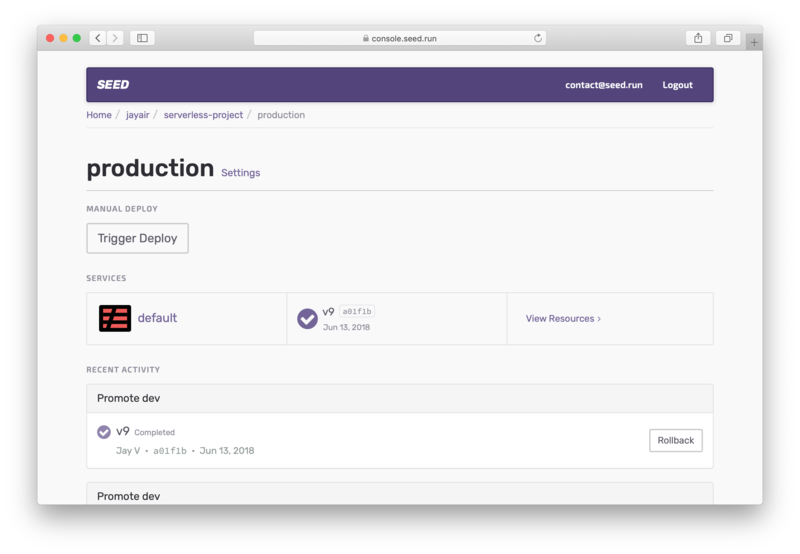 To view the Lambda metrics for a stage, simply select the stage. Click View Resources for the service you are looking for. Here Seed gives you a clear overview of the resources that have been deployed. 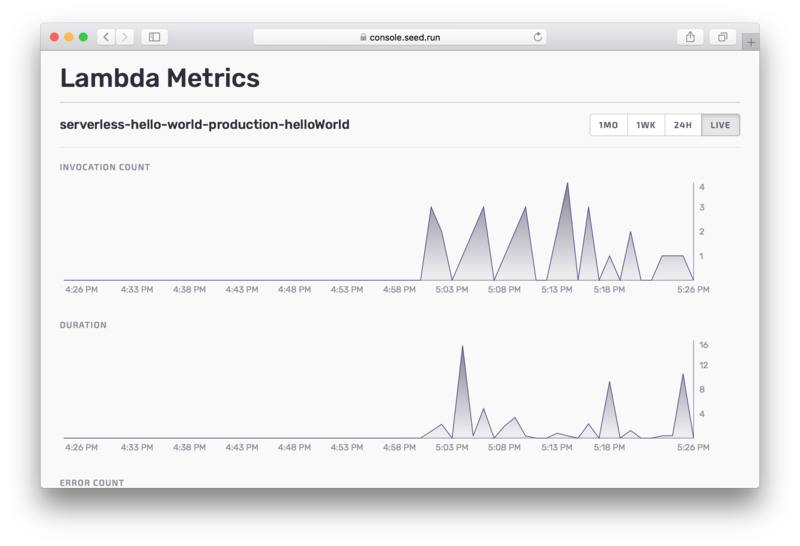 And hit Metrics for the Lambda you are interested in. This is the number of times the Lambda has been invoked. This is the average time (in ms) it took to execute the Lambda. This is the number of times the Lambda generated an error. 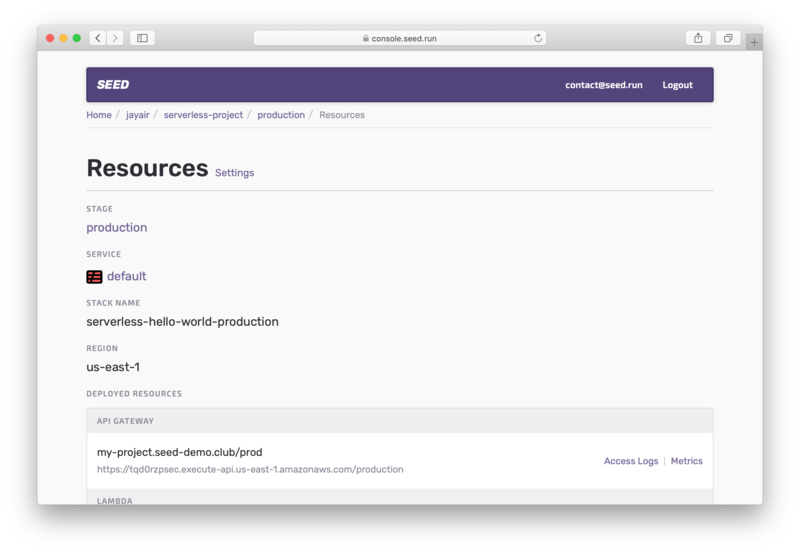 To view the API Gateway metrics for a stage, click on Metrics on the API Gateway portion of your resources. The API Gateway metrics have a bit more info than the Lambda metrics. This is the number of requests made to API Gateway. This is the number of 4xx response errors generated for the requests. This is the number of 5xx response errors generated for the requests. This is the average time (in ms) it took to make the entire request. This is the average time (in ms) it took to make the Lambda part of the request. You might notice in some cases that the Integration Latency is larger that the Latency (even though the Latency should be the total request time). This is because OPTIONS requests do not hit your Lambdas and have an Integration Latency of 0. And as a result it brings down the average for the Integration Latency of requests. You can view the various metrics over the following timespans and each point is the data collected for the given amount of time. So for example, in the 24H setting (24 hours); the total number of points are displayed over the span of 24 hours. While each point on the graph represents the amount of the data collected over the span of 30 minutes. In the case of a count, this is the total number over the span of 30 minutes. And for a duration type metric, it is the average of the points collected over 30 minutes.